At the end of each VAT period we will file your VAT return for you at HMRC. Before we can file your return you’ll need to ensure you’ve entered all your transactions and checked your VAT return for completeness. We’ll complete checks for you before we file your VAT return however we recommend that you review your return and calculations too. It’s quick and easy and you may spot an error with the transactions you entered that we would not be aware of as we don’t have your original records. Our detailed guide on processing of VAT returns explains the steps required to update your records. The following are a summary of the checks to complete before reviewing your return. Do the bank balances in the bookkeeping area of inniAccounts at your VAT period end match exactly the balances shown on your business bank statements? This applies to all business accounts including savings and credit cards. Have all expenses that have been paid for personally by you or any of your employees been recorded in the Quick Entry area? Have all business journeys using a personal vehicle been recorded in the Quick Entry area? Have you entered asset purchases either in Quick Entry area if paid for personally, or into the bookkeeping area if paid from a business account? 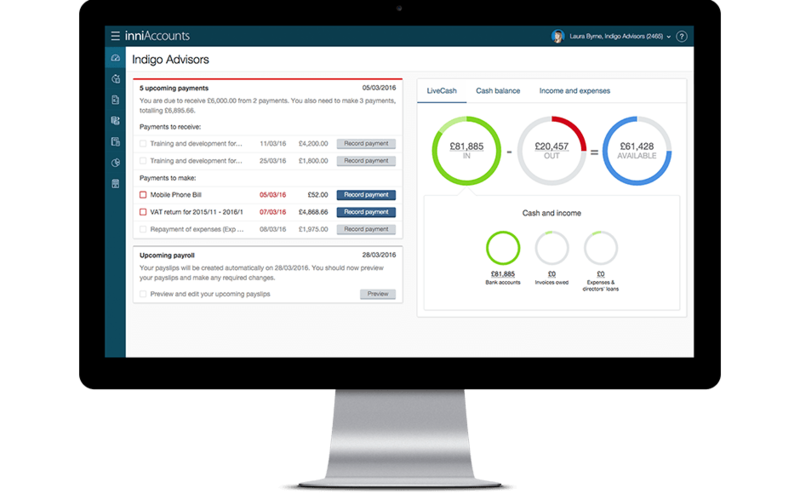 Have all your invoices been created in the application (even if you use a self billing system or create invoices outside of the application)? Once you’ve entered all your transactions for the VAT period and you are happy your records are accurate, you can then review your VAT return calculations. Has the correct Flat Rate percentage for your business type been applied to the sales for the period (your percentage is shown in the calculations section at the bottom of the VAT return)? If you are in your first year of VAT registration, has the 1% discount to your Flat Rate percentage been applied to your VAT return? If your company has purchased any assets costing over £2,000 during the VAT period, are they included in the VAT return and their VAT reclaimed? If you are unsure about any of the entries in your VAT return, please contact your account manager for advice. Hi, if i earn £500 and charge VAT at 20%, thats £600. The VAT man takes 10% back, which is £60 and i keep the rest. Is that correct? If you are registered for the Flat Rate VAT scheme, and the percentage applicable to your type of business from the HMRC list is 10% then the calculation is correct. I want to understand the flat rate scheme further. I am on flat rate of 12% but I was of the opinion that i find net of my VAT, i.e VAT on Sales less VAT of purchases and the the net of that, i apply 12%. Is this incorrect? Hi Abi. Flat rate VAT is calculated on your gross sales amount as the low percentage takes account of the fact that you are not claiming VAT back on any purchases or expenses. Therefore if you invoices sales of £1,000 plus VAT the gross invoice value would be £1,200. On a Flat Rate percentage of 12% the VAT you would pay over to HMRC would be £1,200 x 12% = £144. If using a flat rate vat scheme, do I enter purchases/expenses with a T1 code or a T9 code? For flat rate VAT purchases and expenses should not be included on the VAT return therefore you should use T9. Just want to know when doing VAT Return what kind of expenses can be added to the Input (without VAT) box. You have std purchase, zero rate purchase and expenses. What kind of expenses, e.g. refuge collection, phone, stationery, packaging, light and heating, fuel, commission, business rate, insurance, etc. If you are on the Flat Rate Scheme then you shouldn’t include any expenses on the VAT Return. If you are Standard registered then it should include all expenses whatever the VAT Rate other than items such as wages, PAYE, loans and dividends. Just wanted to know if the Flat rate scheme would be the correct one for me, if in a month I invoice £10000 then the VAT charged would be £2000 so that would mean VAT payments due would be £1740, (£12000 x 14.5% = £1740.00) however I pay invoices to companies that complete work for my company, who are also VAT registered, their invoice in a month would be £3000 including £500 worth of VAT, that would mean that I would pay out more VAT than I collected in, (£1740 + £500 = £2240, and only collect in £2000) would it be better for me going on the standard rate of VAT and claiming back the VAT that I pay out, thanks in advance for this long question. Hi Don. Based on the figures that you have quoted then you are best to be on the standard scheme for VAT rather than the Flat Rate Scheme. As you said, you would be paying £1,740 on the Flat Rate Scheme whereas using standard VAT you will owe £2,000 to HMRC but will be able to offset the input VAT of £500 meaning a net payment of £1,500 to HMRC. The Flat Rate scheme only tends to be appropriate if your costs/expenses are minimal so there is no VAT to reclaim. On flat rate VAT do I have to add the total flat rate to my yearly gross earnings? For the purposes of your profit for the year, the gross sales invoice values less the flat rate VAT paid over to HMRC is assessed.